Here is the revisited, revamped chart of the tentative genealogy for CC that I did last year for the blogathon 2007. The old chart is there. I've changed a few things and added some names. But it's still the same schemas. The question marks are directors I'm not sure where to place. If you have any suggestions, please leave a comment. Criticism of this classification is of course welcome (that's one way to look at this trend and there are probably other ways to represent this selective history that are more productive). It's interesting to note how CC seems to mend the blurry fence between documentary and mainstream narrative fiction. 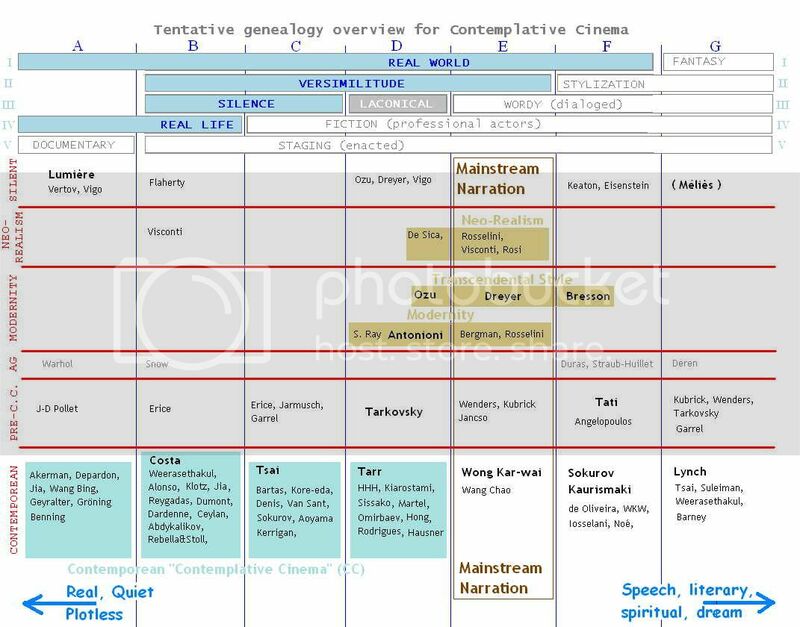 The 3 yellow columns are the most common modalities of traditional cinema. Some of the CC auteurs are listed in several column because their oeuvre covers a wide array of film types. Sokurov for example is the most versatile, as he's made films in almost every column (even where I didn't cite his name). But other CC auteurs are exploiting a personal style that belongs to only one column. The names featured mean they are representative of this sub-family, either because they are consistent or because the only film fitting the profile becomes a touchstone. Although this chart should be detailed with film names to avoid generalisations. The CC auteurs in all CAPS are figureheads for that column. They are my personal choice, so they are arguable. I may be biased by those I'm most familiar with, or those I like best. And I might overlook others who are more representative, or more productive, or more precursors to deserve the spotlight. Anyway the upper part (precursors from the silent era to pre-CC) is there to give a summary context, there might be errors, but the lower part (contemporean CC auteurs) is the taxonomy that matters. So that's where I'd like to look into the association between the auteurs within a sub-family. All this can always be improved with your feedback. I've also added a few links between individual auteurs to show a direct influence on their filmmaking. That could make another "map" just for the inter-generational connections. Anybody knows more links to be made that would make sense of a certain historical continuity? Just recently re-watched Hiroshi Shimizu's Arigato-san. I really think Shimizu is more a precursor of CC than either Ozu or Mizoguchi. Both admired Shimizu greatly -- and recognized that there were some things he could do that were simply beyond them. It is a crime that Shimizu's major works are totally unavailable (there were unsubbed Japanese videos, but even these are probably out of print now). Where should I put it on the chart? Silent era only or his late filsm too? D or E or something else? Probably D -- his most important era was early 30s to early 40s. One important aspect for Shimizu is "reality of place". His films make place very tangible. He is very like Kiarostami (though AK probably never encountered his work). Ok I updated the picture. I also changed the dialogue spectrum in the chart header. Which was going from "silence" to "speechy", but it is not as clear as that. Only the "mainstream" format make greater use of text (dialogue and overstated narrative structures). The stylized and imaginary columns give up words as well as the left columns. Sometimes they go totally wordless, like Barney for instance. I kept the "neorealism" label to italian auteurs only. But I didn't know if it could be extended outside this territory and timeframe? Ozu and Mizoguchi are considered a neorealist too, right? Satyajit Ray also, I think. And like you suggest, Kiarostami is a neorealist in the core. I just discovered your wonderful blog this Sunday night and am enjoying it very much. Very interesting and runs the fine line between pedantism and relevance. Thanks for this graph although it is, in my opinion, still very very much a sketch. For example, the Tarkovsky of The Sacrifice or Stalker or Andrey Rublev is very much in the "Speechy" column. Also, Egoyan has done so many different films, you'd be hard pressed to slot him into a category on this graph. One can argue he shouldn't be here at all. You (we) are on our way though! There's been an attempt to sometimes shoehorn a few directors in there, like Barney, who is on an art gallery filmmaker, not a "silver screen" filmmaker. Keep up the good work and I'll visit often. You're right it's a sketch to help visualize the commonalities and the distinction between all teh filmmakers we talk about here. I realized there was more and more people fitting in the nebulous trend of "contempative cinema". So it doesn't make any sense to say they all belong to the same type of cinema. I wanted to draw the line between the older generation and today's generation. As well as distinction of characteristics on the spectrum of realism in sub-families. Keep in mind that when a filmmaker appears on this graph, it's only for his films deemed "contemplative", not for his/her whole oeuvre. For instance, The Sacrifice doesn't belong. And while Stalker is very speechy, the plot is very thin and not a traditional "mainstream" narrative drive. Egoyan is a last minute addition that I didn't really thought through, so maybe I'm wrong. I was thinking most especialy in Calendar which is kinda "speechy" but quite anti-narrative in a traditional way. Exotica is also a succession of scenes without much of clear narrative continuity, focusing on mundanity rather than threading an overall suspense-driven plot. We could make a case for The Adjuster, Family Viewing... within the "mainstream/speechy/narrative" contemplation column. Of course we can argue these choices, move things around a little bit and update this chart one more time. P.S. leave me an email if you want to join this team blog and add your own posts. I see what you mean with the films rather than the directors entering the graph. "Calendar" is indeed contemplative cinema: little or no plot, speechy but it's mostly irrelevant to the action (chit-chat rather than conversation), and cyclical and repetitive structure. "Exotica" I wouldn't agree so much, but it's hard to call it a mainstream/industrial film either. Egoyan seems to be definitely trying to tell a story (with plot and other bits) during the film. As for Cremaster, yes, it was shown in the King cinema in Lisbon just like any other film would so I have to concede you are right. Come to think of these fantasy films, how about Ken Russel of The Devils? Another director which should be in there somewhere is Pasolini, no? Ok, I might be pushing it with Exotica... it's certainly not the most representative anyway. I don't know Pasolini (only seen Gospel) nor Russel, so if you want to suggest particular films, there is a chronological list that is more inclusive for referential purpose. And we have a stricter model for a more precise definition of this trend. Maybe you already found these pages.